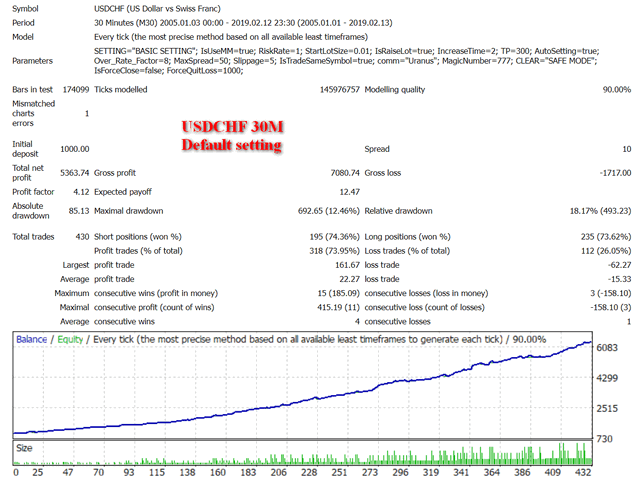 Uranus MT4 EA uses reverse trading strategy. 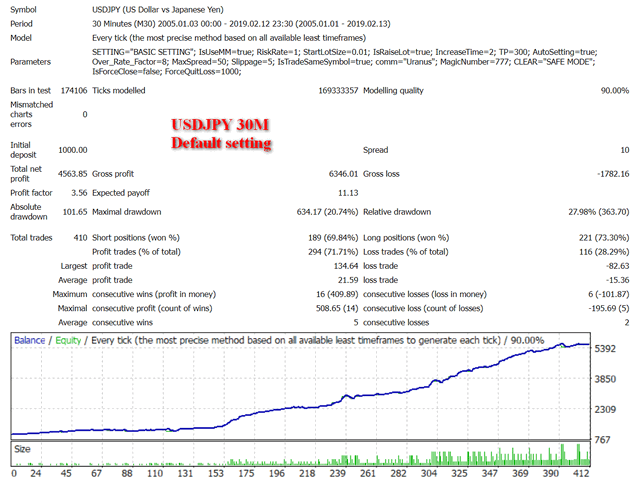 The EA detects reverse signal and the price level to make trading decision. A trade will be opened if the price moves to the oversold or overbought area and reverse signal appears. The EA will add more trades if the market moves against the previous trade, however, this is not martingale or grid EA. It will consider closing all trades at the best price. This is a medium term EA. It is very easy to use and can apply for different symbols. It works on accounts with 4 and 5-digit quotes. This EA is recommended for M30 timeframe. 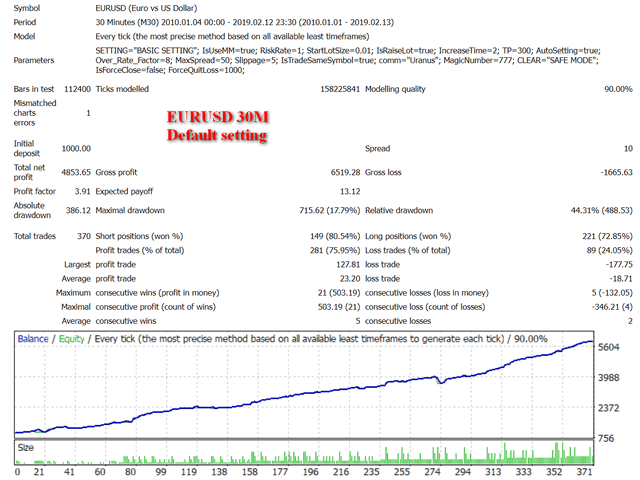 The default settings are optimized for EURUSD, USDGBP, USDCAD, US DCHF, USDJPY with M30 timeframe. IsUseMM=true - if 'true', use money management. RiskRate=1.0 - 0.01 lot per 1000 unit balance. StartLotSize=0.01 - if ‘IsUseMM=false’, this lot size is used. Increase Lotsize?=true - if 'true', increase a lot size each trade. Increase Time=2 - times that lot will be increased. 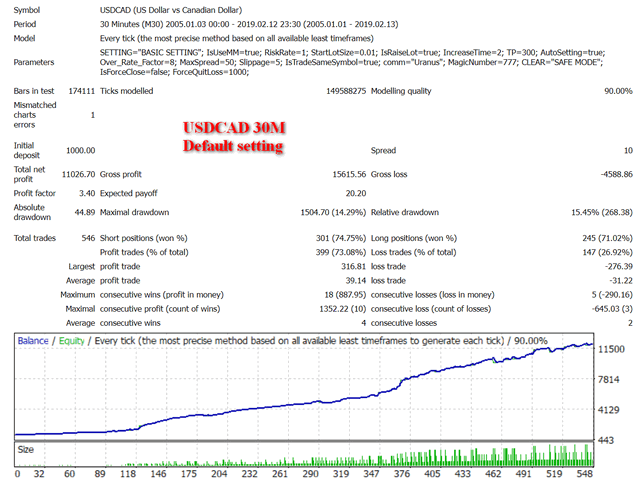 Min Profit in Points=300 - minimum potential profit in points. AutoSetting=true - if 'true' EA will select 'Over factor' automatically. Over factor=8 - determine the oversold/overbought area. Acceptable Spread in Points=50 - maximum acceptable spread to perform a trade. IsTradeSameSymbol=true- if 'false', the EA will not open a trade in case this symbol is already opened in this platform by this EA (ex: the EA will not open EURUSD trade if the pair USDCHF is opening). Use safe mode?=false - if 'true', close all trades if the total loss exceeds a certain value. Max Loss in percent=50 - maximum loss percent of balance (Use safe mode?= true). Added a new filter condition. Added parameter "AutoSetting" to select "Over factor" automatically.